Fantastic style and a pretty interesting story make for this dark high-school movie about a disturbed young man and the strange path in life that he comes across. A pretty wild and strange movie about a boy who has emotional issues and feels oppressed by his school and the society he’s living in. Donnie does some pretty terrible things and that sets him apart from really being a good guy, but in the arguments he has with others, he’s not wrong. Donnie is for free speech and opinions He welcomes conversation and disagreement, but what he finds is that most of the authorities in his school do not. Donnie has dreams about a human-sized rabbit that seem to be leading him in an unknown direction. And while all this is going on, with the taking on the school and the dreams that lead to him sleep-walking at night, Donnie meets a girl and starts up a relationship. There are a number of things that make this movie unique. The first is that a major event happens at the start of the film, and then the movie kind of drops that and moves on, whereas most other films would have spent lots of screen time examining the results of what happened, and letting these results become the story of the film. The second thing this movie does that is so unique is it makes the protagonist somewhat of a criminal. He floods one building and sets another on fire, and yet we keep riding along with Donnie, siding with him in the fights, because he actually stands for something in a society of people who want to just accept what’s being thrown at them, without ever asking questions. 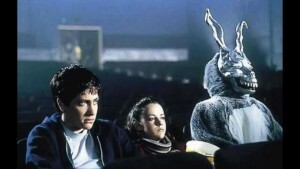 Donnie Darko is a strange high school movie about a disturbed young man who finds a way to bend time. That’s where the movie ends up going, but for most of the film, it’s about this guy trying to make sense of his life and the new skills he’s uncovering. He has sleepwalking dreams about a giant rabbit named Frank who seems to be leading him down a path to do something, where he has no idea what he’s headed for. The movie starts with a bizarre singular event and then chronicles everything that happens in Donnie’s life afterwards. The funny thing is that most of what happens nothing to do with this event, and instead is just about what this character was in the middle of going through in his daily life. The event in question here is that an airplane drops a jet engine and it falls right through the sky, landing in Donnie’s room. If Donnie was home, he would most certainly have been killed. But as it happens, he was out sleep walking that night and fell asleep on a golf course. There are multiple ways this storyline can go. One is the Final Destination route of having the character obsess about how maybe he should be dead. Another is to have this character become an instant celebrity, maybe just in the town, but still, to have this event really shake up his life. Donnie Darko doesn’t feed on any of that. The movie isn’t about the event, and simply uses it just to kick things off and grab our attention. It also introduces us to the situation where Donnie dream walks and then does disturbing things. One of them is that he breaks into the school, floods it, graffitis the ground in front of a statue, and then puts an axe through the head of the statue. We don’t see him do any of this, but Donnie is aware that he did it, and confesses it to his psychiatrist. This movie has a serious cult following and it’s not hard to see why. It’s about a rebel who many would see as a villain, doing things like this to his school. Only Donnie is more of an anti-hero than a villain. He calls out the school when it seems like they are feeding him ridiculous choices and not willing to talk about any alternatives or have real conversations about the topics. This first happens with a teacher who is showing a video that features a self-help guru who is preaching his new program. According to this man, Jim Cunningham (played by Patrick Swayze,) in life, every action that one takes is motivated by either love or hate. And everything falls on a spectrum with those two ideas at the endpoints. When Donnie’s teacher starts preaching this idea and asking for students to come up and put different situations on the spectrum, Donnie lets loose. It’s a typical health-like exercise, but Donnie makes the point that there might be other factors going on in these people’s lives and that we really don’t know what is motivating them. Donnie ends up telling off the teacher and getting suspended. This brings the idea that the boy might be disturbed to the attention of his parents. They go and meet with the psychiatrist and learn all about the imaginary bunny rabbit friend. Guess there is no such thing as doctor-patient confidentiality here. His mother, played by Mary McDonnell, might be the most down to earth person here. She’s certainly the voice of rationality among the other parents, and in particular, the one who is also the teacher that Donnie had the problem with. His mother goes to speak to this teacher, to try to make sense of what happened, and doesn’t get anything back, other than the woman criticizing her parenting. Donnie doesn’t just stop with this incident with his teacher. He also attacks Cunningham when the author comes to the school to speak in front of a packed auditorium. The forum becomes a question and answer session at one point, and that’s when Donnie sees an opportunity to speak up. He asks Cunningham how much he is getting paid and if he really believes the crap he is trying to sell everyone. Then later, there’s another incident with Cunningham, where Donnie takes action and we learn a little more about Cunningham than we might have been expecting. While Donnie is in the process of taking on the school, during these strange few days, he also meets a girl. Gretchen, played by Jenna Malone, is new to the school and she opens up to Donnie right away. She’s awkward and depressed, just like he is, and she finds a sort of soul mate in him, or at least, someone she can trust with the details of her life. Gretchen comes from a broken home where her dad had emotional problems and tried to kill her mom. Now they have run away from him and fled to this new town. The romance between Donnie and Gretchen is one of the big stories on the table here. It’s not like they have any dates or anything, but the teenage romance often feels more like a friendship, with the two of them being able to confide in each other. Especially during this time when it seems like the whole world is against them. Donnie finds himself living in an oppressed society, and by society, I mean school. While his principal and teacher are clearly against him, there are some teacher who do see things his way, or share the same free-minded spirit and passion as he does. Drew Barrymore plays one of these teachers. She’s a literacy teacher who gets deep into the books she’s reading with the class, and has an unconventional way of teaching. For example, when Gretchen first walks into the room, the teacher tells her to sit next to the boy who she thinks is cutest. Then, once Gretchen has chosen where to sit, the teacher tells the student who is already sitting there to just get up and find another seat. This kind of approach to teaching is interesting and certainly against the formula or standard practices, and it leads to the character becoming a sort of enemy of the school. Meanwhile, Donnie has a number of talks with a third teacher, played by Noah Wyle, and these involve time travel. Donnie starts seeing a path coming out of people’s bodies in the form of a clear bubble leading them in the direction they are going. This path gets further and further ahead until Donnie realizes that he can actually see time before it happens. All of this combined with the book he’s reading about the laws of time travel enable him to try something out himself, by the end. This is a creative and unusual movie. At times it reminds me of a David Lynch movie (the rabbit-man who gets stabbed in the eye and then has his hand over it at the movies. But unlike somte of Lynch’s films, everything in here makes sense. The movie is surprisingly not very hard to follow, considering everything that it does. This is a black comedy if ever there was one, and is extremely dark and stylish. The results make for a pretty great film.